An easy overnight marinade and then a day in the slow cooker for this flavorful chicken. 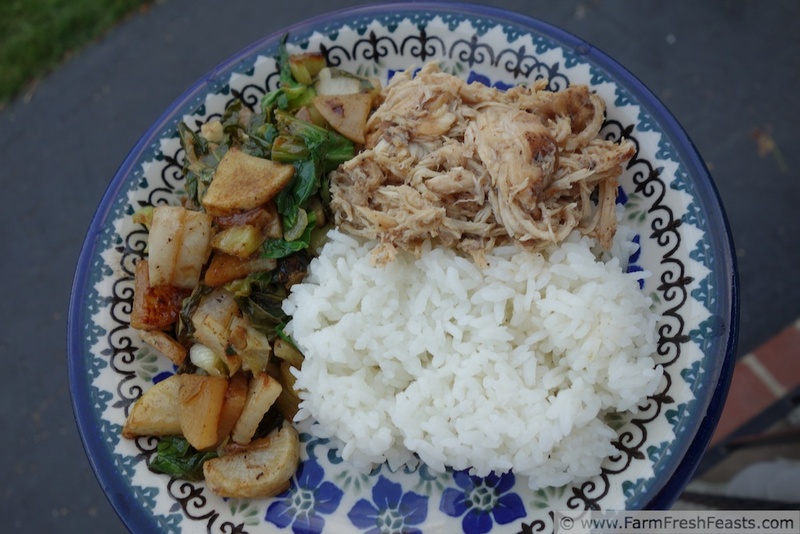 The farm share Daikon and Bok Choy side dish comes together quickly. During my time on active duty I was fortunate to work with nurses from all over the world. In addition to learning about different points of view and different cultural aspects of nursing care, I also got to eat the most amazing foods at work functions. I've never been to the Philippines, but I first tasted Chicken Adobo thanks to a Filipina nurse. It's crazy easy to make in the slow cooker using pantry ingredients (start the night before) and results in a bunch of moist, tender, flavorful meat, along with juices suitable for flavoring CSA farm share veggies in a way that entices your kids to eat them. For other recipes using Bok Choy, please see my Bok Choy Recipes Collection. For other recipes using Daikon, please see my Daikon Recipes Collection. These collections are part of the Visual Recipe Index by Ingredient. If you'd like to know how to Use This Blog, click here. Place all ingredients in a gallon size zip top bag. Refrigerate overnight. NOTE: If this is a bulk shopping/freezer cooking event, label the bag and stick it in the freezer. If you choose to freeze, take the bag out a day or two before you're planning to cook it and let it thaw in the fridge. 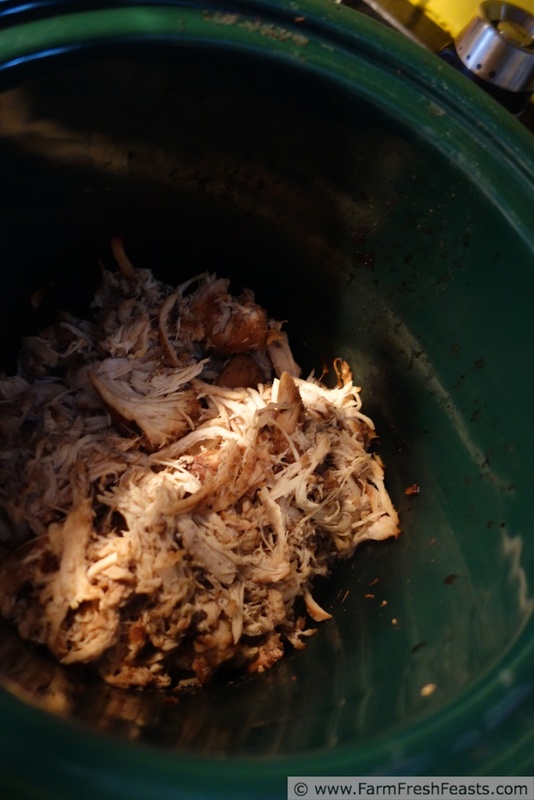 When you are ready to cook, dump the contents of the bag into a crock pot (3 quart will do it). Set it to Low for 6 to 8 hours. Take the chicken out, throw away the bay leaf, and shred the chicken between 2 forks. Or chop it with a knife into bite size pieces. Pour the liquid into a saucepan, saving about 1/3 of a cup to moisten the meat. Return the meat to the crock pot, and reduce heat to Keep Warm if you have that option. Bring the saucepan to a simmer until the liquid is reduced by about half. Preheat skillet to medium, add a thin film of oil. Add sliced onion and sauté 3 minutes or until soft. Add Bok Choy stems and Daikon radishes and sauté 5-8 minutes until soft. 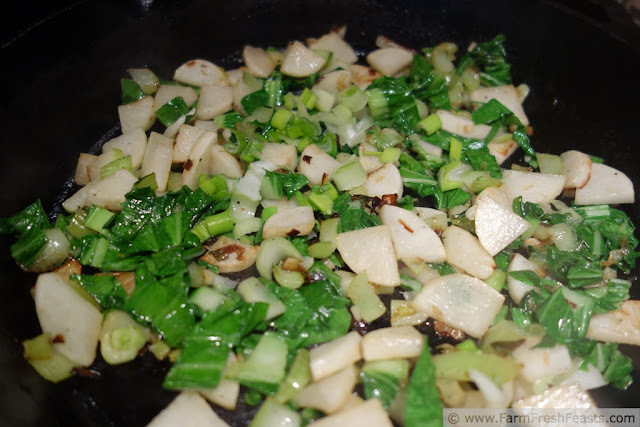 Add Bok Choy leaves and sauté until wilted. Pour reduced adobo sauce over veggies. Simmer another minute or two until thoroughly coated. We like to eat this with "two scoop rice". Stay tuned for how I use the rest of the meat (yes, there are leftovers!) in a repurposed leftover, Chicken Adobo Summer Rolls. This post joined the party What's In The Box at In Her Chucks! 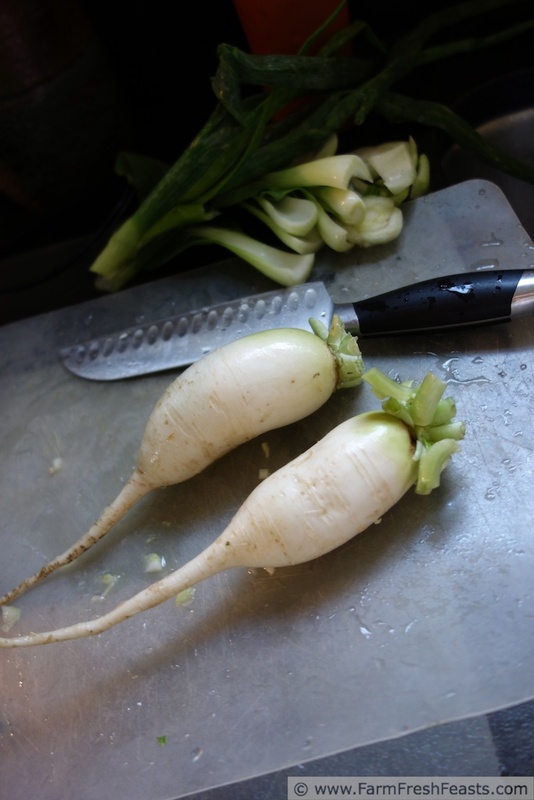 Thanks, this recipe is just in time--I got some daikon in my CSA bag last week and we have a little stand-off every time I open the veg drawer. Lasar, glad you like it. Lucky you live Hawaii-easy to find Aloha Shoyu! Thanks for sharing and linking up!! Heather--If you like hummus, daikon discs dipped (bonus alliteration) in hummus are da bomb! Thanks for hosting What's In The Box! I think I need to try this. Pinning! We don't do much chicken but I do have some in the freezer and this looks good. Curious about the ad on your site - it shows Scott Honour for Governor of MN. Scott and I went to school together - not sure if you placed it or it was random. I didn't place the ad, nor do I see it (I've got beer and TV shows . . .) my guess is that it's fueled by cookies, and each visitor gets more personalized ads. Yum, this looks delicious, Kristen! As much as I use my crockpot, I've never thought about marinating the chicken before throwing it in the crockpot. I usually only marinate when grilling or baking. Thanks for sharing the link to this in the Food Bloggers Roundup Group. I'll be using this one in my roundup. Have a great weekend! Thanks for including my link in your round up. I'm always on the lookout for new crock pot recipes! 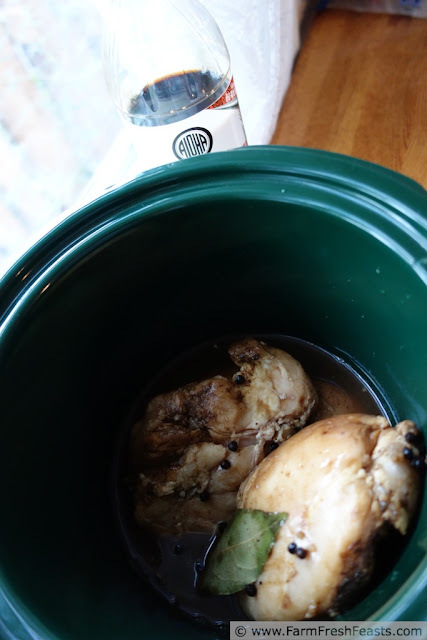 This is a bit different than my chicken adobo recipe but it has made me want to try mine in the crock pot Thanks! As much as I like using my crock pot in the winter for soups and to have dinner ready when we come home from activities, I also like to use it in the spring/summer/fall to keep the kitchen cooler.